What’s better than tiramisu? 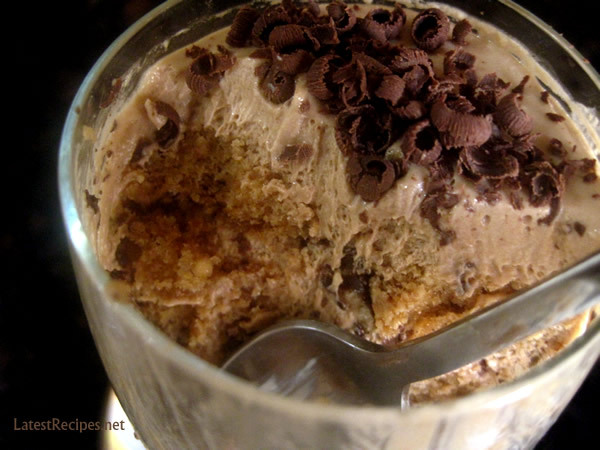 Why, chocolate tiramisu, of course! This is Giada de Laurentiis recipe as seen on her show, I forgot which because she has several shows, it’s one of my favorite recipes. I made this for Valentine’s last week – I divided the recipe into 3 containers, gave the 2 small ones away; the left-over cookies and filling, I layered it in a goblet just for me. it’s not part of the recipe but I always put grated chocolate before adding on another layer, just because..
Add cream and chocolate to a heavy small saucepan. Cook over medium heat, stirring often, until the chocolate chips are melted and smooth. Set aside and keep warm. Whisk the egg yolks, sugar, Marsala, and salt in a large glass bowl until blended. Set the bowl over a saucepan of simmering water, but do not allow the bottom of the bowl to touch the water. Whisk the egg mixture over the simmering water until it is thick and creamy, about 4 minutes. Remove from the heat. Place the mascarpone cheese in a large bowl and set aside. With an electric mixer, beat the cream and ¼ cup of the sugar in a medium bowl until soft peaks form. Fold the whipped cream into the mascarpone. Then fold in the chilled Chocolate Zabaglione. Cover and refrigerate. Whisk the warmed espresso and the remaining ¼ cup of sugar in another medium bowl until blended. Line a 9¼ by 5 by 2¾-inch metal loaf pan with plastic wrap, allowing the plastic to extend over the sides. Working with 1 cookie at a time, dip 8 cookies into the espresso, and arrange in a single layer side by side over the bottom of the prepared pan. Spoon ⅓ of the mascarpone mixture over the cookies to cover. Repeat dipping 8 of the cookies in the espresso and layering the cookies and remaining mascarpone mixture 2 more times. Dip the remaining 8 cookies in the espresso and arrange side by side atop the tiramisu. Press lightly to compact slightly (the last layer will extend above the pan sides). Cover the tiramisu with plastic and refrigerate at least 6 hours. One Response to "Chocolate Tiramisu"